So here it is our final few hours onboard the lovely Oceania Riviera. I’m sad to leave but so happy that I have discovered the wonders of this fantastic cruise line. We decided to take breakfast in the Grand Dining Room, table for two no problem at all, and we were seated by the window, again watching the coming and goings on the dockside. Breakfast didn’t disappoint how could it? I had my final salmon bagel of the cruise, a lovely warm croissant and strawberry jam and a pot of hot, fresh breakfast tea. I don’t know if it’s the tea brand, the water or the milk but the tea is like the best tea you could ever wish to taste. Our favourite waiter is waiting at the door to give us a hug goodbye and wish us safe travels. Everyone is just so nice, so genuine, and I guess that’s what makes this such a happy friendly ship. We could have disembarked at any time to suite ourselves. The bulk of the passengers had already disembarked and it wasn’t even 9.00am. But I wanted to complete my customer questionnaire which I hadn’t got around to yet, so we took our hand luggage and went and sat on deck in the early morning sun. That completed we headed back down to deck 5 and disembarked. Hand luggage was carried down the gangway for me and right until the very end, nothing was too much trouble. The crew of Riviera are a credit to Oceania Cruises. I can’t wait to sail with them again, and I hope it won’t be long before I do. So, now we are in the cruise terminal at Piraeus and reality hits big time. Oh, yes, it walks right up to you and slaps you right around the face! Cases are located with ease, so now we just need to head outside and get a cab. 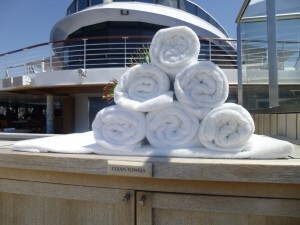 Sounds easy, but as well as Oceania Riviera disembarking there was also an Azamara ship. Add to that a ship load of Thomson passengers who were here as a port of call and it all bottle necked at the exit. I thought there was going to be a punch up for taxis at one point, with people pushing and shoving, others dodging round the back and getting in taxis at the back of the queue which generated arguments amongst the taxi drivers. 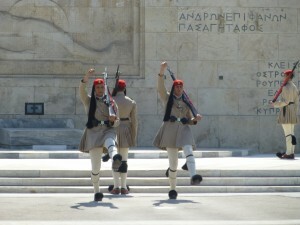 We decided to just wait our turn as best we could and were soon in a taxi enroute to Athens at a fare of 25 euros. The traffic was bad, so I think we hit Athens early morning rush hour. He took a few little detours up and down back streets and bus lanes, but we always ended up back in the thick of it. Total journey took about 40 mins. We had arrived at our destination, Hotel Grande Bretagne, Athens. Unfortunately we arrived at the same time as a heck of a lot of Oceania and Azamara guests were checking in, plus the same amount checking out having done a pre cruise stay. A receptionist was working her way down the queue checking where she could assist so I informed her we had a day room booked fully expecting it not to be ready until 11.00am. As we wanted to go out for a wander around and to see the changing of the guard anyway we agreed to leave our cases with the concierge and return later. Our hotel was on Syntagma Square so was ideally situated for the Changing of the Guard, which is the main thing I wanted to see, and the main shopping area. I know most come to Athens to see the Acropolis, but I had seen more than enough of that as a child so had no desire to return. If you recall, I don’t do monuments and history! I do recall seeing changing of the guard as a child, but I like a bit of pomp and ceremony so that was my goal today. The shops were nice, they had a really good selection, and if it hadn’t been so searingly hot we might have enjoyed the look around, but we were just melting. We walked to the bottom of the precinct and back and went in loads of shops, including an M&S. Well you have to don’t you?! It was nearing 11.00am so we walked upto the square for changing of the guard. Unfortunately there was a demonstration on today so there were barriers infront of the soldiers but usually you can walk right upto them. The guards are chosen for their height and must be over 6ft. Their uniforms are pretty unique but its tradition, as is there rather odd march. I wonder how or why they don’t feel a bit daft performing it, but its their tradition I guess. How they stick it out in the heat of the sun for a whole hour I do not know. They must bake in those tights, and skirts! Thankfully the hotel was just across the pedestrian crossing. We checked in and were given our room keys on the fourth floor. We were told that our cases would follow but we are far too impatient for that and needed swimming attire like now, so we went down to the baggage room ourselves and located the cases and dragged them to the lift ourselves. We had a Classic room overlooking the courtyard. Pretty impressive room I have to say and reminded me very much of the 5* Park Lane hotels. Very high ceiling and a large chandelier hung over the bed. The table was at rather a strange angle to the mirror, but we had everything we wanted and most of all I wanted comfort. There was no way I was stepping off Oceania Riviera and then slumming it, not even for a day. 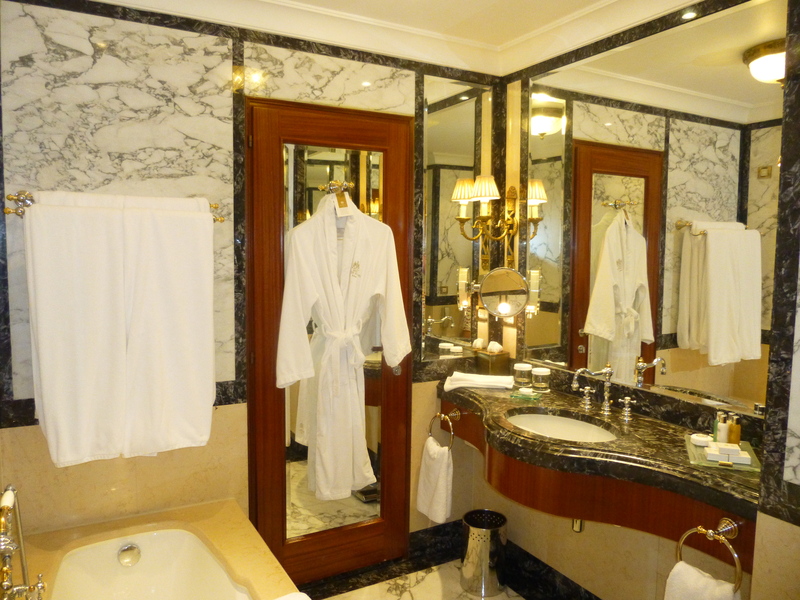 The bathroom can only be described as sheer elegant traditional and it was massive. Large bath, separate large glass shower cubicle. Wall to wall marble. 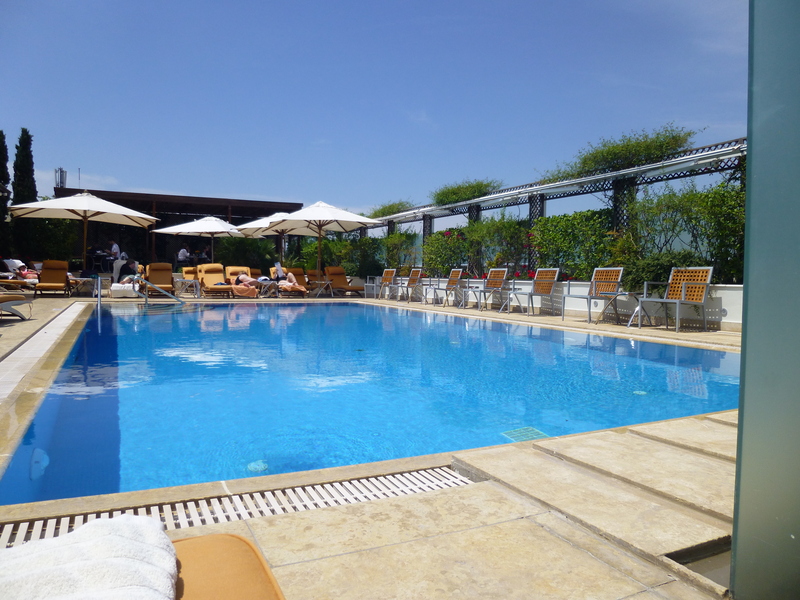 But we had sunshine to enjoy, so we quickly changed into something a little more comfortable and went and took up residence by the roof top pool. And relax! It was hot, it was edging towards 30 degs and nothing was keeping me cool, no breeze, no nice waiter offering me complimentary iced water or soft drinks. There was a waiter, but he wanted 17 euro for a cocktail so we declined. We were determined to make the most of the sun for as long as we could but I caved long before Lizy. I was tired, it had been an early start and even later night with a flight and a long drive ahead of me, so I decided to go back to the room and get showered and try and rest my eyelids for an hour. 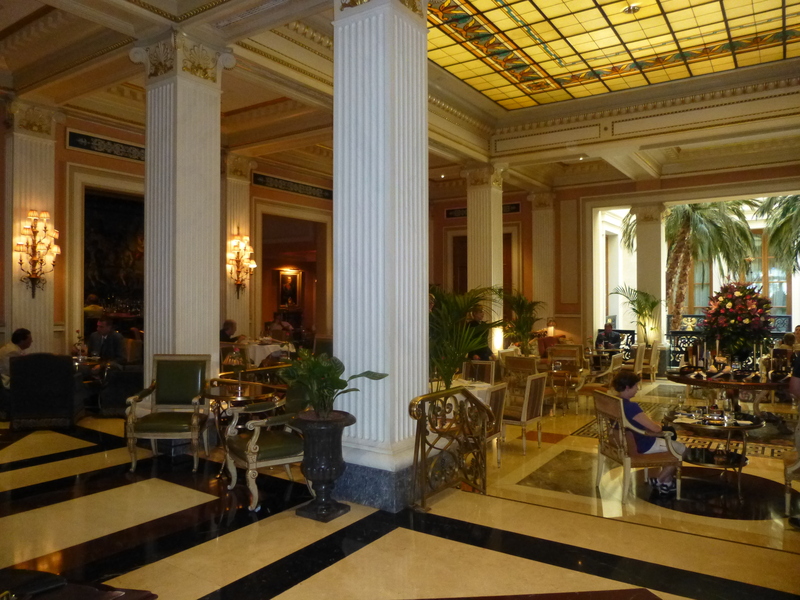 The Grand Bretagne is very regal, almost Downton Abbey like. The maids all dress in period costume of long black dress and white frilly apron with little frilly hats. En route I stopped by the Roof Garden Restaurant to see their famous view of the Acropolis. That was another tick in the box for me. 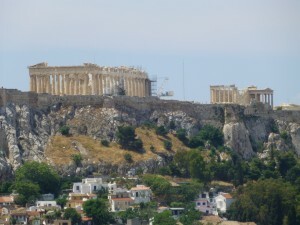 I had been to Athens and I had seen the Acropolis. 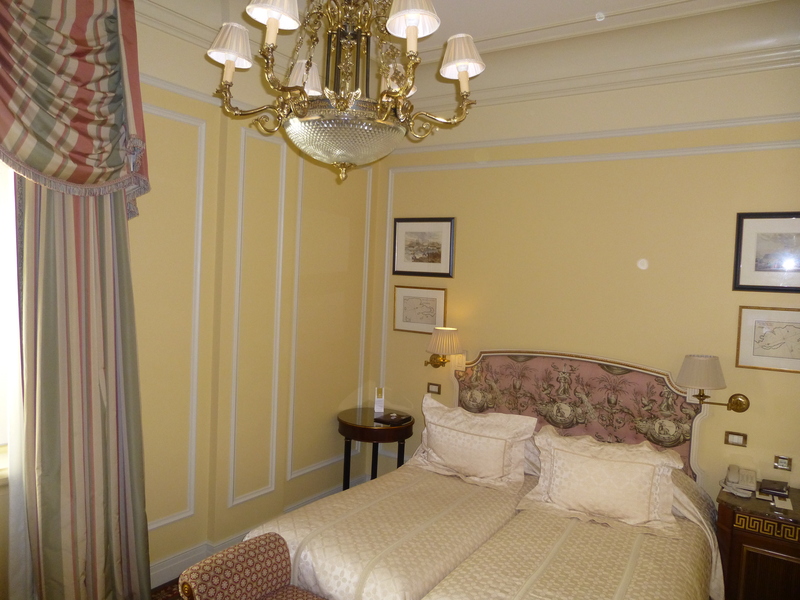 So if you want a good pre or post cruise hotel in Athens I can highly recommend Hotel Grande Bretagne for style, facilities and location. I tried really hard to sleep but it just wasn’t happening, and at 5.00pm we decided we should be making tracks for the airport. We had investigated the train earlier and it seemed simple enough, but could I be bothered with the hassle? As we checked out we were assisted by the doorman and he hailed a cab for us. Stavros would you believe! Well Cleopatra checked us in, so it all added to the Greek theme. Cab to the airport from central Athens was quoted as 38 euro. His cab was spotless, puts our taxis to shame. We drove past the changing of the guard again and caught a glimpse of them doing their thing as we passed. It seemed quite a journey to the airport but at least the roads weren’t so busy. He commented that we were very quiet, but I explained the heat had zapped me. Stavros advised I don’t go back in July or August then. No Stavros I wont! As we arrived at the airport he offered to get us a trolley, loaded the trolley for us and I thought was a really nice gesture. We opted to sit outside the airport for a while and have a drink as there was a nice gentle breeze blowing now. Once inside the airport we used our fast track priority status to get our bags checked through and went through passport control and browsed the few shops. It was a modern airport but not big on retail outlets in the part we were in. We decided it must be hot chocolate time, well maybe a bit early but there was little else to do. It was nice, but not as nice as our Oceania hot chocolate, and it was in a paper cup! We perhaps should have gone in the executive lounge but it didn’t seem worth it as there wasn’t long until the flight time. We went through the fast track queue at security and only waited about 5 mins before we were invited to board. We were at the front of the queue, but there was a woman determined to get in front of me. Annoyingly she won, but oh how smug did I feel when she was asked for her passport and had put it away in her hand luggage and couldn’t locate. Perhaps if she had concentrated a little more she might have heard the repeated instruction to have your boarding card and passport open. I think she may have learnt her lessen the hard way as she was asked to step out of the queue until she was ready. So here we are on the plane, I sense a bit of urgency to get everyone on. Oh please don’t loose our slot. I have Mrs Greek Business woman sat next to me. She has not stopped jabbering on her phone. She’s not best pleased about something. Then the safety announcement starts but clearly it’s not applicable to her. In the end the stewardess tells her to switch off her phone. And then, she knocks my arm off the arm rest! Like its hers! I was not impressed, now she is having a fidget and has kicked off her shoes and has tucked them up on the seat. I’m not a happy bunny. I’m a tired grumpy bunny. Soon after take off she gets out a bag of toiletries and heads to the loo. I’ve already spotted that the row behind has two vacant seats, so why couldn’t she have been sat there? I had somehow ‘fallen asleep’ by the time she came back to her seat. Oh dear, was I leaning her way? That must be why she decided to take up residence on one of the two spare seats behind. I’m sure she had more space anyway. So a bit of subtle air rages from me and now we had three seats between the two of us. Surely we can utilise them better for sleeping? I moved to the window seat so I could lean my head on the window and try and sleep. Lizy tried several different positions to try and lay across the two remaining seats, but it wasn’t working. Neither of us was comfortable, we were cold, we just wanted our beds, preferably our Oceania beds with a pot of hot chocolate. I was so relieved when the pilot announced that we were starting our descent. Welcome to a freezing cold Gatwick airport very late at night. Our flight must have arrived at the same time as a plane load from the Costas. Oh I’m not in the mood for queues, passport control, screaming tired kids and baggage arrivals. Cases were quickly located. Our meet and greet parking was advised we were enroute and it was waiting for us outside by the time we had nipped into M&S for sandwiches, bread and milk. Nice meet and greet man had warmed the car up too which is far better than getting into a cold car. Lizy had to navigate and get me on the right road. It was 11.00pm UK time but 1.00am our Greek time. It was not a good time to be driving, but I did ok until Oxford when I caved in and didn’t know if I needed fresh air or a nap. I decided to pull in at a services, go use the facilities and see how I felt after the fresh air hit me. Have you ever been into a motorway services in the middle of the night when the majority of the services is closed? They are spooky, eerie places and I got proper freaked out. By the time I got back to the car I was wide awake, so carried on with the journey, arriving home just before 3.00am. So what did I really think about my first cruise experience on Oceania? Well, if you haven’t worked it out yet, you really haven’t been paying attention. I don’t think I have ever been on a ship with such efficient and friendly service, amazing food, luxurious decor, nice ambience etc. I have cruised on all sorts of lines from Thomson and Island (I was forced in the 90’s lol) most of the mainstream cruiselines, P&O, Cunard, Royal Caribbean, Celebrity etc, and to date Silversea had been my ultimate favourite as I do like a bit of luxury! And whilst Siversea is still ranking very highly as one of my favourites I do think that Oceania has the edge. Why? Well I just found everything to be so right, perfect might not be the right word, because what is perfection? I know what it wasn’t. 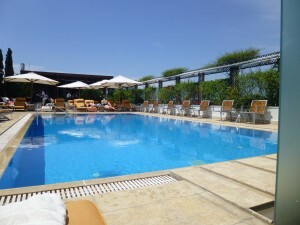 It wasn’t pretentious or stuffy, it wasn’t cold and uninviting as many 5* hotels can be. Oceania appears to have the perfect balance. Service with a smile, service which excelled, but that put you at ease. The crew were just immaculate, perfectly laundered clothes, very smart but practical uniforms for day time and evening, and some of the nicest most welcoming crew I have ever met. Every passenger is important to them and it shows. They all go the extra mile and it makes a difference. The food was just beautifully presented, always hot, tasty and delicious. As well as the four speciality restaurants that we tried, which were complimentary, there was also Privee the most stunningly elegant private dining room to suite 16 guests. A choice of food from Toscana and Polo Grill were offered and the waiters wore white morning suits to match the colour scheme. 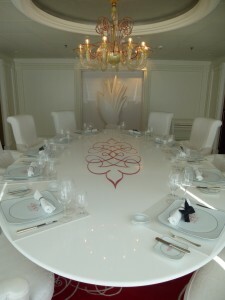 There is also La Reserve which offers a seven course meal with wine pairing. 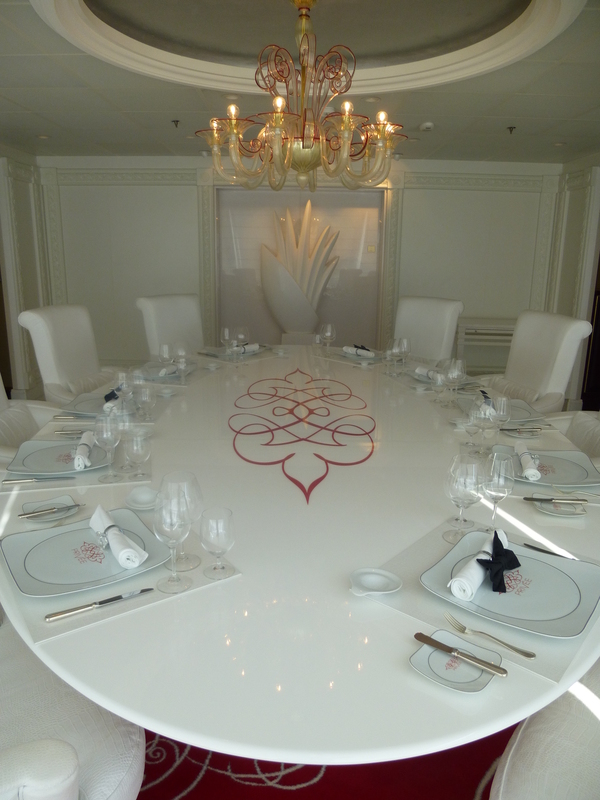 Plus if you have a suite there is in suite dining served course by course from any menu on the ship. I did nipped in an out of most of the suite grades on our final morning and all I can say is wow. 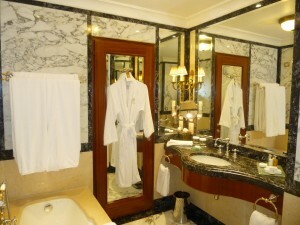 Suites were totally amazing and included personal gyms, media and TV rooms, separate lounge, dining room and bedrooms. Whirlpool baths in huge bathrooms with a window looking out to sea, and huge balconys with whirlpool bath with flat screen TV above. Sheer luxury! 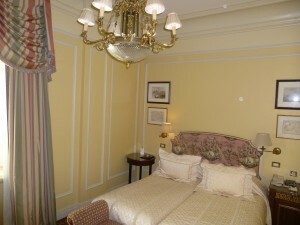 I will share more with you regarding the suites some other time. Country House casual dress code is a strange one for me to get my head around, but I soon worked out it more or less meant wear what you are comfortable with. Many gents wore a jacket and open neck shirt in the evening, some wore a suit, others just trousers and an open neck shirt. Ladies wore anything from cocktails dresses to something a little more casual. The Captains Welcome drinks reception was a very informal affair. Some went in the daytime deck wear as it started at 5.45pm, others went in cocktail wear. No hard and fast rules on what you should and shouldn’t be wearing. But as the drinks are compliment of the Captain until 8.00pm you could go to any bar on the ship, which is something I have been saying is a much better idea for years. 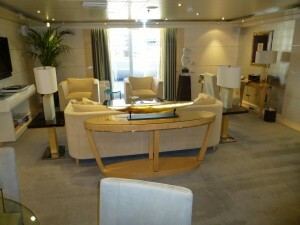 The itineraries offer some smaller more boutique ports of call. Four of the ports during this cruise were new to me and I loved everyone of them. 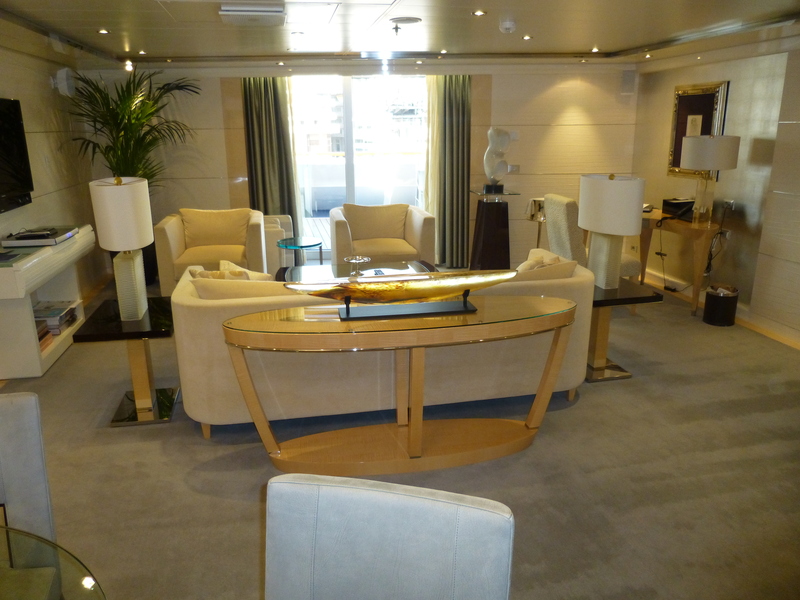 At 66 000 GRT Riviera is a relatively small ship but she has so much to offer. You could start with eight choices of places to dine, plus in suite dining. Six of those eight dining venues are included in the fare! 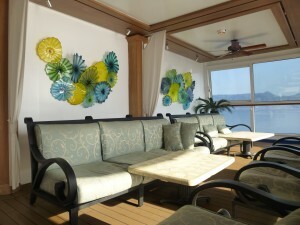 I loved the decor, I even found the hand picked art interesting. The various sculptures, lalique staircase, mirrors and tables, the crwam leather sofas in the lobby, and I loved the unique litte seating areas that were dotted around the various areas of the deck. Top deck offered croquet, shuffleboard and a minature gold course. The more I think the more I recall things that I haven’t told you about. But I have to leave some theings for you to discover yourself! 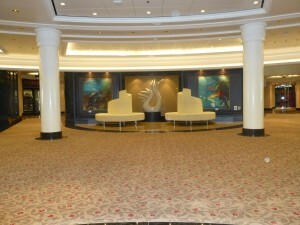 Would I cruise again with Oceania? You bet I would, in a heartbeat. Excellent value for money when you look at what is included, and sheer luxury. I have never felt so welcomed and valued as a passenger on any ship I have cruised on, but on Oceania they ensure that every passenger feels welcomed and valued. Be warned Mr C, I am already studying the Oceania ‘Your World, Your Way’ brochure very closely!